By now most of us know the stories of “lost” cocktail ingredients like orgeat, grenadine, and pineapple gum syrup. These are well known to us today, in part, because their fortunes are linked to many famous (and delicious) cocktails: orgeat to the Mai Tai, grenadine to the Ward 8 (among others) and pineapple gum to Pisco Punch. (The lesson here is that it pays to be well connected if you’re an obscure cocktail ingredient.) Today however I am going to talk about an ingredient far less storied and far less referenced in “The Canon” of famous cocktails. In fact, this ingredient is most famously associated with a cocktail many (if not all) of us would likely eschew if one were offered to us today. This is a story about crème de noyaux—along with a little history of its poster-child cocktail, the Pink Squirrel. According to the source of all truth (wikipedia), crème de noyaux (or noyau as it is may also be spelled) is “an almond-flavored pink crème liqueur made from apricot kernels.” Actually, that’s most of the article quoted for you right there. Short and, unfortunately, misleading. Why? First off, it is inaccurate to say crème de noyaux is “almond-flavored.” Crème de noyaux may taste of almonds, but no almonds, as such, are used to make it. (Aside: Amaretto, another “almond-flavored” liqueur, is similarly almond-free.) Second it doesn’t tell you that in addition to apricot kernels, noyaux may also be made from peach and cherry stone kernels, possibly a combination of all three. Third, it doesn’t tell you that, being made from the kernels of fruit in the Prunus genus, it contains traces of amygdalin, which is converted into cyanide as a side effect of digestion. (OK, by the enzyme beta-glucosidase, if you must know). Finally, it doesn’t tell you what the heck makes it pink. Today, of course, that pink is likely to be good old artificial food coloring. I’d hazard a guess that once upon a time it was colored with cocineal, though my research on this was quite inconclusive. Here in the United States crème de noyaux has pretty much vanished. In the San Francisco bay area where I live, the only brand of crème de noyaux I see with any regularity on the liquor store shelves is the Hiram Walker, the provenance of which I can only speculate. Mostly or entirely artificial in flavor and color would be my guess. (If someone can prove me wrong, please do.) Elsewhere you may find Bols, DeKuyper and Marie Brizard, but these may be called crème de almond instead of noyaux—a name which I believe crept into usage in the 1950’s. (Someone with a set of Old Mr. Boston Guides could probably help settle this.) One of these offerings, the Marie Brizard, is also completely clear. The French are a bit luckier, naturellement. Best as I can tell from the Internet, they have two choices, de Poissy and de Vernon, both of which are naturally flavored. However Erik Ellestad has tried obtain these (according to his blog entry on the Eye Opener Cocktail) but without any success. (Either that or he’s not sharing with the rest of us. ;->) Also unknown to me is whether these offerings are tinted the traditional pink or not. In May 2009, Erik Ellestad wrote up his experiences making the Old Etonian cocktail (part of his on going project to make all the cocktails in The Savoy Cocktail book). The Old Etonian calls for the elusive crème de noyaux. Erik had received a bottle of homemade noyaux from another famous blogger, Matthew Rowley at Rowley’s Whiskey Forge. I already knew the execrable state of domestic noyaux, Rowley had published the recipe he used on his blog and since I love making exotic ingredients, I knew right away that I had found my next project! 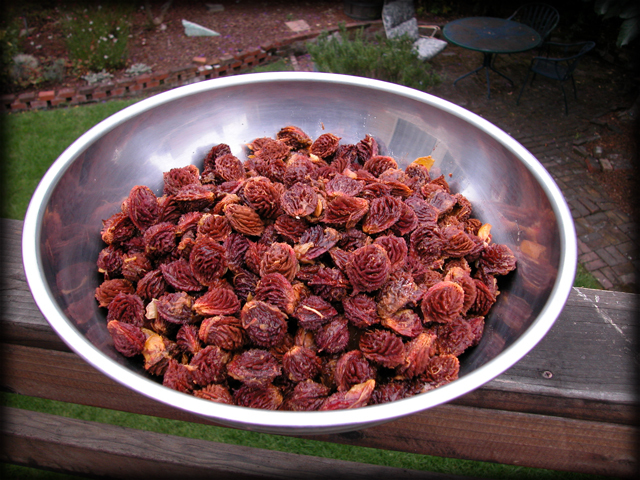 Pound the peach or apricot kernels – some also pound peach stones – steep them for one whole month in four pints of brandy in an earthen jar, and at the end of that time add a syrup made of two and a half pounds of sugar and 2 pints of water. Mix all well together, and then filter, and bottle and seal, and keep in a cool, shady place. As you can see, it’s a straightforward and relatively uncomplicated process. The only real challenges are collecting the peach stones (you need quite a few) and then cracking them open to extract the kernels inside. To get my peach stones I took a tip from Rowley and went to a local bakery well known for their fruit pies: Bake Sale Betty in Oakland, CA. As it turned out, the owners were familiar with making liqueurs from apricot pits, so my request wasn’t completely strange to them. All I had to do was wait for peaches to reach their seasonal peak, a which point the bakery would start making their pies, saving the stones for me. A few weeks later, I stopped by to see how things were going at which point they handed me a stack of “to go” boxes filled with peach stones, about 20 pounds worth. As they say, I had scored. Incredibly grateful, I promised to come back in a couple of months with a bottle of crème de noyaux, in payment. Cracking peach stones open is the really hard work, any way you do it. Rowley used a hammer and cracked them open on the concrete sidewalk outside his house. I decided to try using a pair of giganto-sized Vicegrips to split them open. It took me the better part of two hours and my hands were hella sore for a day afterwards. 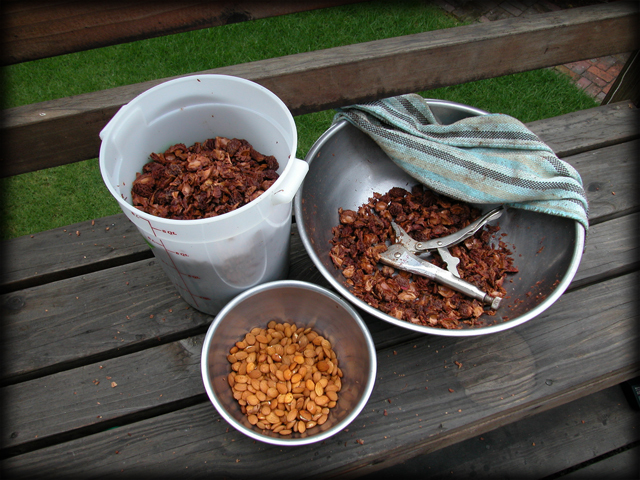 But, for my trouble, I obtained 8 ounces worth of the precious kernels, enough to make two batches of Rowley’s recipe. The rest of the recipe involves pounding the kernels in a mortar and pestle, macerating them in the cognac, waiting, sweetening and then filtering the results. Let me add a couple of notes about sweetening and filtering. Sweetening: While waiting for Bake Sale Betty to collect peach stones for me, I was given a small pile of nectarine stones which I used to make a test batch of the noyaux. Nectarine stone kernels turn out to be much less fragrant than those from peaches and the resulting liqueur was pretty lackluster. However, by making it I determined that the amount of sweetening specified in Rowley’s recipe was way way too much for my palate. I find the Cajun palate is generally inclined to make things much sweeter than I prefer, so this wasn’t too surprising. When it came time to sweeten the batch I made with peach kernels, I used half the amount of sugar called for. Filtering: Even after filtering through several layers of fine muslin, the noyaux retained a suspension of very fine particles. Over the course of about a month, these settled out, allowing me to rack off almost perfectly clear liquid. I tried to reclaim what was left behind (several ounces) by using regular Melita coffee filters, but most of the particles simple passed right through the paper. I suspect that if you really want to get things perfectly clear, you’ll either need to use a Buchner filter and 3-micron filter paper discs or try following the procedures provided on Rowley’s blog from the same book as the noyaux recipe. These involve using felt and or isinglass. The homemade noyaux definitely has a unique aroma and taste. The nose is very effusive, practically volatile. There’s a lot of marzipan backed by the grapey scent of the cognac in which the kernels were macerated. The marzipan continues onto the tongue where it’s joined by a little tea and the sugar. It finishes with a distinct bittersweet edge, which at first I found a little challenging. I was worried that the bitterness would dominate the experience of drinking the noyaux, much the way tannins can build up on the tongue and dominate the fruit in a young cabernet. That did not happen. Instead I found that after a few sips, the sweet and bitter components achieved a pleasant equilibrium. I was reminded of the experience of tasting a Del Maguey mezcal for the first time: you sense you’re drinking a very “pure” product, something from the earth which has been processed just enough to express itself fully and no more. Of these, the Mikado, a variation on the Japanese, is my personal favorite though, ironically, it also contains orgeat which is of course made from…almonds. I find this somewhat diminishes the impact of the crème de noyaux. The Lily is the only one of these in which crème de noyaux plays a significant role, equal in proportion to gin and Kina Lillet. However I can’t say I really love how that one tastes. Too angular a combination of tastes, me thinks. Stir over ice. Serve in coupe with a lemon twist for garnish. Despite my best efforts, I was unable to find any attribution for this cocktail. If you know anything about it, please drop me a line and let me know. The most famous crème de noyaux cocktail is, of course, the Pink Squirrel. I decided to learn what I could about it for this blog post. The trail led me to Bryant’s Cocktail Lounge in Milwaukee, Wisconsin, where, legend has it, the cocktail was invented. Byrant’s, as it turns out, is still around and still makes Pink Squirrels (and Grasshoppers) as part of what looks like a serious bar program. I contacted the folks at Bryant’s to answer some of my questions. According to John M. Dye (manager) and Shirley Lowery (former manager and first licensed female bartender in Milwaukee), Bryant Sharp invented the Pink Squirrel in 1941. (Prior to 1941, Bryant’s had been a beer hall, tied to Miller Brewery.) The original recipe called for ice cream and not the heavy cream called for by modern recipes. In the 1960’s, Bryant’s second owner, Pat Malmberg, decided to cut the crème de cacao from Bryant’s original recipe since felt it was unnecessary. Bryant’s still makes their Pink Squirrels according to this recipe today. I also quizzed Dye regarding the brand of crème de noyaux that Bryant might have been using in his original cocktails. Dye says he’s believes it might have been Bols but really he’s not sure. He says that Bryant’s has a long history with Bols and they use their crème de noyaux today. 1- Was pre-Prohibition crème de noyaux colored pink? 2- What was originally used to color crème de noyaux pink? 3- Are the French offerings pink colored? 4- At what point did crème de almond become a “synonym” for crème de noyaux? 5- When did the Pink Squirrel first appear in the Old Mr. Boston guide (and with or without the ice cream)? I’ll end this with an original recipe of my own. It’s pretty simple and to the point. Along with rye, I’m mixing the noyaux with maraschino, which is made from the kernels of yet another Prunus genus fruit, the cherry. Stir over ice. Serve in a chilled cocktail glass.